Come to the Country RV Dealer, Drive a Little, Save a Lot! In 2000 Craig Smith, owner of Craig Smith Auto Group, opened Craig Smith RV Center in Galion Ohio. Craig decided that when someone came to Galion to look at a Recreational Vehicle that they deserved first class treatment in a first class dealership. 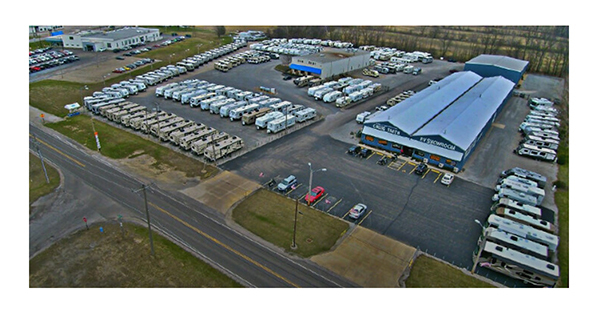 Craig Smith RV Center in Galion, Ohio now features a 25000 sq ft indoor showroom and a state-of-the-art 10 bay service facility with certified technicians. We feature an onsite propane station and sanitary dump station, a complete parts and accessories store and more. All of these great features out in the country in beautiful Central Ohio. Because we selected this site, our overhead is low, our expenses are low, so our prices are low. Come to the Country RV dealer, Craig Smith RV. You'll immediately see why, if you drive a little, you'll save a lot. "Our business has flourished as more and more people take advantage of our competitive pricing, and world class service." "We now offer all the Best Selling Class B motor homes on the Market, including Leisure Travel and Roadtrek's full line of Class B RVs." "We are Central Ohio's exclusive full line KZ Dealership." When you find the RV of your dreams at Craig Smith RV Center in Galion, rest assured you will find the area's best selection, competitive pricing and world class service after the sale. Enjoy browsing through our site. We sincerely hope that we can be a part of your RV lifestyle and we look forward to serving you. If you want to learn more about what we have to offer, you can contact us for all of the details today!